So the other morning, I woke up on the right side of the bed. My daughter had a good night’s sleep, I went to bed early, and I greeted the early rays of sunshine coming through the window in a happy, feel-good kind of mood. Think I’ll get my juicer out for a while…. I’ve had this song playing in my head for about three days now. There seems to be a random ditty on repeat in my head whenever I’m making cooking pretty much 24/7. Is that normal? I especially get songs stuck in my head when I’m creating in the kitchen (remember my coconut buckwheat banana bread? Yeah, I had “Put Dee Lime in Dee Coconut” and “If You Like Pina Coladas” stuck in my head for a week. PS: not the real song titles). I once considered including a song selection for every recipe I posted, but uh, I won’t do that to you guys. Just know that each of my creations on this blog came to fruition amidst a melody or two, either played on my mental stereo or audibly by some electronic device. Apples: flavonoids, polyphenols, and a moderate amount of vitamin C. These antioxidants fight free radicals, protecting the collagen in our skin from oxidative damage. The presence of the flavenoid quercetin, especially abundant in the peeling of Cortland, Golden Delicious, and Monroe varieties, can also offer us built-in protection from the sun’s damaging rays. Beets: A secret antioxidant treasure trove. Beets are unique in that they have an unusual mix of phytonutrients, which is unlike that of most antioxidant-rich fruits and vegetables. These antioxidants will help keep skin smooth and wrinkle free. Beets are also a potent anti-inflammatory and detoxifying food, making them a must-have if your goal is a clear, glowing complexion. Carrots: The beta carotene (a carotenoid compound) in carrots will literally give your skin a golden glow. I’m fascinated by this study done by the University of Nottingham. Researchers concluded that when shown photos of subjects with a sun-induced tan or the glow from eating more carotenoids, people prefer the carotenoid-induced skin color. Furthermore, the antioxidants are thought to keep skin looking younger by fighting the free radicals that lead to aging. Oranges: Obviously, oranges are bringing some serious vitamin C to the (breakfast) table. We’re talking nearly 100 percent of your daily value in one orange. Vitamin C is important for many reasons. Beauty-wise, it keeps skin younger by supporting collagen production, helping to keep skin firm and elastic. You can boost this juice even further by adding a chunk of ginger or turmeric root. Both are fabulous for reducing inflammation (turmeric also has potent antioxidants). 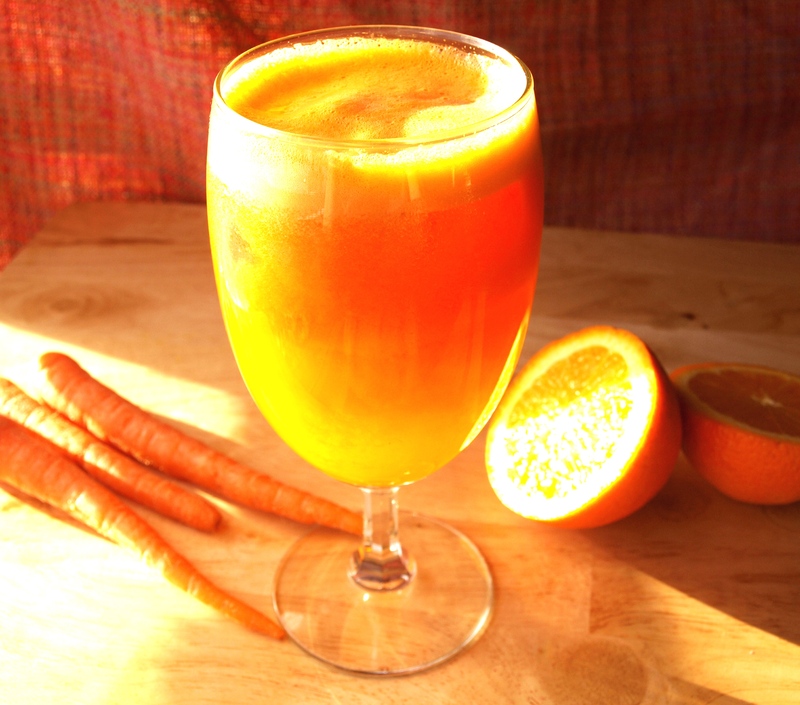 Do your skin a favor, whilst encouraging a lovely beginning to your day, by whipping up this vibrant juice. While you’re sipping you’ll feel like a carefree fusion of butterflies, flowers, and sunbeams (even if there is a -12 wind-chill and 2 feet of snow outside). Yep, it’s a beautiful morning. Feed all ingredients into your juicer. Makes 1-2 servings. Serve over ice. If you don’t have a juicer, you may be able to use a powerful blender. Just add water as needed to get it blending. Then strain the pulp out by pouring it through a nut milk bag or fine mesh sieve. 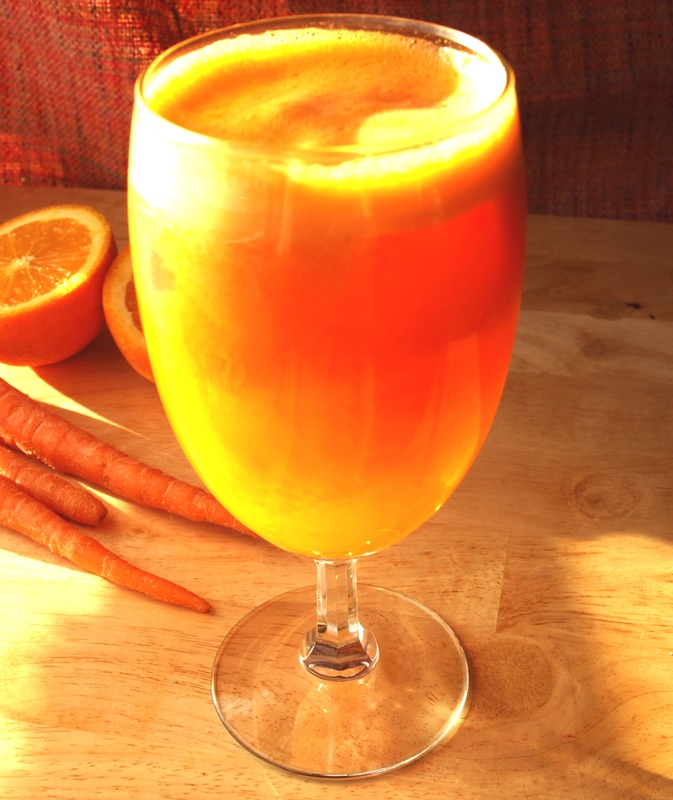 You will want to drink this juice the same day you make it, as it doesn’t have any preservatives. Tell me! Is it just me, or do any of you nearly always have a song playing in your head?